Wood, James . "Canadian Army ". The Canadian Encyclopedia, 26 September 2017, Historica Canada. https://www.thecanadianencyclopedia.ca/en/article/canadian-army. Accessed 19 April 2019. The history of the Canadian Army parallels that of Canada itself. What started as a small Confederation-era militia was built into a respected force of mostly citizen soldiers for the First and Second World Wars. From the Korean War to United Nations peacekeeping to Afghanistan — despite limited resources and sometimes ill-defined missions — Canada's now largely professional army has served with distinction around the globe. One of the Canadian government's first concerns at Confederation in 1867 was to establish a home defence force for the small nation of only 3.5 million people. The greatest threat to the new country came from the south — the United States — with its population of 36 million. The Militia Act of 1868 (see Militia Acts) created a sedentary militia of all men aged 16–60. This force only existed on paper but was supplemented in peacetime by an active militia, whose soldiers trained for 8 to 16 days a year. In 1870, more than 13,000 militiamen volunteered to guard Canada’s borders against a threatened attack by Irish-Americans known as the Fenians. The Fenians hoped to aid the cause of Irish independence from the British by drawing imperial forces to North America to protect Canada. Their attacks failed, and by 1871, Britain was instead finalizing the withdrawal of its last garrisons in Canada, leaving the militia to defend the country. In March 1885, more than 6,000 men volunteered to quell the North-West Rebellion, an uprising of Métis and Aboriginal people on the Prairies. The force sent by Ottawa to subdue the rebellion was commanded overall by British officer Frederick Middleton; aside from a few other British staff officers, the force was Canadian. These part-time soldiers were untrained and poorly equipped but enthusiastic, and they made their way quickly to the West on the newly completed sections of the Canadian Pacific Railway. The force lost its initial battles, including at Cut Knife Hill under the field command of Canadian Lieutenant Colonel William Otter. However, it rallied at the Battle of Batoche on 12 May 1885 — prompting the surrender of Louis Riel and other rebel leaders. Overall, the militia suffered casualties of 26 dead and 103 wounded in its first major campaign. From their Métis and Aboriginal adversaries, militiamen learned the value of mounted-rifle tactics and staying well hidden in trenches or firing pits. Otter became a hero back home in Ontario. In 1899, Otter commanded the first contingent sent to fight the Boer republics in South Africa — Canada’s first overseas war. Despite resistance in much of French Canada to sending troops to fight for Britain in an imperial war, Prime Minister Wilfrid Laurier compromised by sending an infantry battalion of 1,000 volunteers. Canada would pay the costs to enlist, equip and transport these soldiers to South Africa, while Britain committed to paying all expenses after their arrival. Laurier emphasized that this was not to be considered a precedent that committed Canadian troops to a fighting role in all future British wars. Two more contingents were raised to serve in South Africa, bringing the total Canadian enlistments to more than 8,000. Lord Strathcona, Canada’s high commissioner to London, also personally financed a unit of 600 mounted riflemen, which would later become a part of Canada’s permanent force as the Lord Strathcona’s Horse (Royal Canadians). 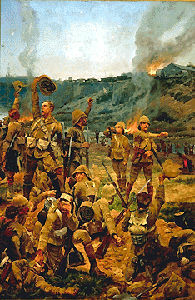 The Battle of Paardeberg is the best-known Canadian engagement of the South African war. 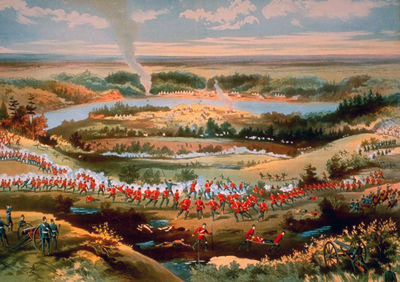 Canada's first contingent failed to heed the order to retreat and held their own (courtesy The Corporation of the City of Toronto). Pride of accomplishment in South Africa boosted public support for a volunteer army. Frederick Borden, Laurier’s minister of militia, introduced the Militia Act of 1904 to implement key reforms, including the creation of a militia council headed by a Canadian senior officer who would hold the highest military post of chief of general staff. 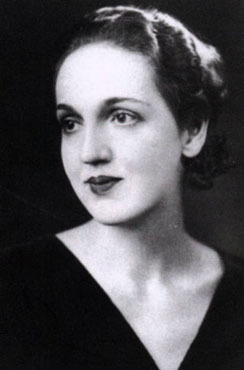 Amid a growing sense of Canadian nationalism, there remained a devotion to the Empire that would soon become the driving force behind Canada’s involvement in an all-consuming world war. In 1868, Canada’s military budget stood at $1.6 million; by 1914, under Prime Minister Robert Borden, it increased to $11 million, providing a first-line militia strength of 74,213 men and a permanent force of 3,110. When Britain declared war on Germany on 4 August 1914, Canada was, automatically, also at war. Colonel Sam Hughes, a strong militia advocate and Borden’s minister of militia, sprang into action. He ignored the mobilization plans set in place by his staff, considering these too slow and cumbersome to be effective in a war that many expected would be over by Christmas. Instead, Hughes contacted regimental commanders directly, instructing them to enlist volunteers as quickly as possible and make their way to a new training camp under construction at Valcartier, Québec. 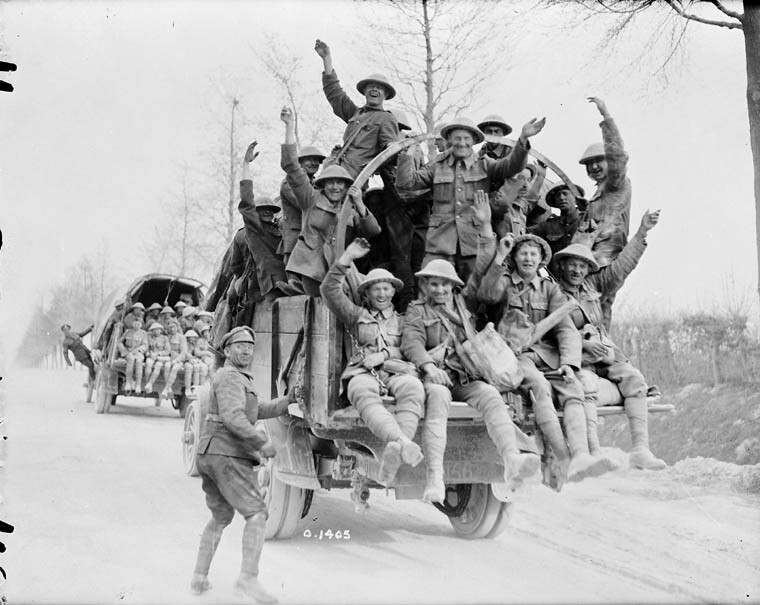 Within weeks, more than 30,000 soldiers had been mobilized and equipped; they embarked for Britain as the First Division of the Canadian Expeditionary Force (CEF). Early recruits came primarily from the cities, and 70 per cent of the first contingent was British-born. 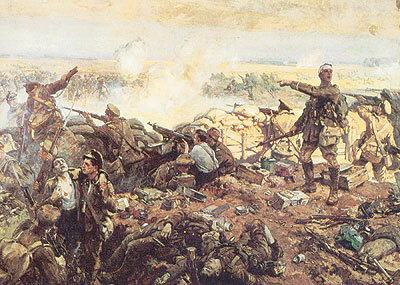 The CEF saw its first major action at the Second Battle of Ypres in 1915, where the Canadians established their reputation as resourceful, determined fighters — the troops standing firm in the face of the first German chlorine-gas attack of the war. They successfully defended the Ypres salient while nearby allied troops fled before the horrifying impact of the previously unused chemical weapons. A second contingent arrived on the Western Front soon after. 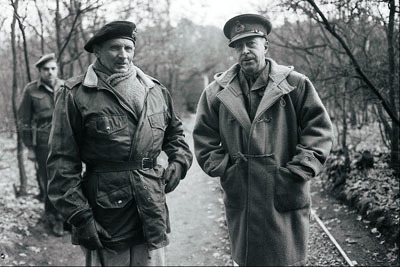 Hughes and his generals were determined that Canadian units would once again stay together at the front. 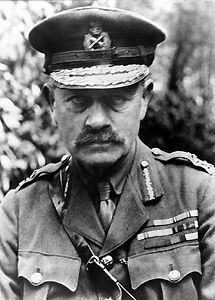 British Lieutenant General E.A.H. 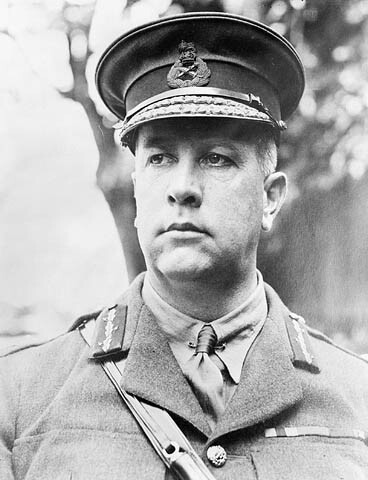 Alderson commanded the Canadian Corps, while Canadian Major Generals Arthur Currie and R. W. Turner commanded the First and Second Divisions. 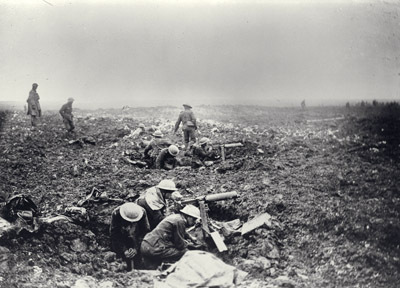 The addition of Third and Fourth Divisions in 1916 brought the Corps up to a strength of 70,000, but casualties were mounting at an alarming rate. Units of new recruits arriving from Canada were broken up to reinforce existing battle-experienced battalions. The Canadian Corps developed a strong sense of national pride, especially since its divisions stayed together, unlike British divisions that were moved around from corps to corps on a regular basis. Following their return to Canada in 1919, most disbanded CEF soldiers returned to work as clerks, farmers, teachers, loggers, miners and factory workers. The permanent force once again stood at about 4,000, consisting of the Royal Canadian Regiment (RCR), the Royal 22e Régiment, the Princess Patricia’s Canadian Light Infantry (PPCLI), the Royal Canadian Dragoons (RCD) and Lord Strathcona’s Horse. The 40,000-strong militia remained a reserve component of the army. Exhausted by more than four years of the bitter, costly war of attrition from 1914–18, Canadians became isolationists and there was a loss of support for military spending. In September 1939, war broke out once again between the Allies and Germany. Canada prepared to stand at Britain’s side — but this time as an independent nation. The First Canadian Army was formed under Lieutenant General A.G.L. McNaughton. By 1942, it boasted three infantry divisions, plus two armoured divisions and two armoured brigades — most of the troops training and awaiting deployment from Britain. Except for two battalions sent to help in the failed defence of Hong Kong, Canadian Army units saw little action until the amphibious raid on Dieppe, on the coast of France on 19 August 1942. Of the 4,963 troops of the Second Division that landed on the Dieppe beaches, 907 died, 586 were wounded and 1,946 were taken prisoner. 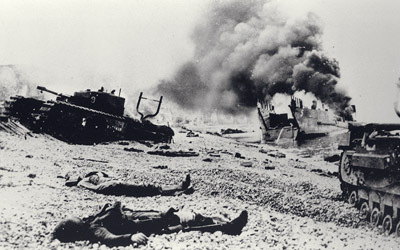 The horrendous casualty rate could find only small justification later in the war, when many of the mistakes of Dieppe were taken into account by Allied planners preparing for the invasion of Normandy. Bodies of Canadian soldiers of the Calgary Regiment following Operation Jubilee, 19 August 1942 (courtesy Library and Archives Canada/C-14160). 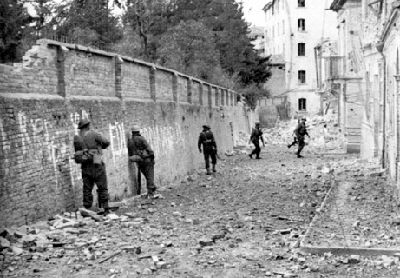 In 1943, the First Canadian Division was finally thrown into action, in Italy. 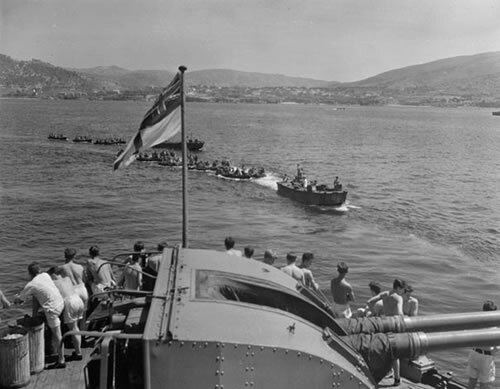 The Canadians advanced through Sicily with General Bernard Montgomery’s British Eighth Army and then began the long, difficult campaign up the Italian mainland. While developing their expertise in the co-operation of infantry and armour, the 92,757 Canadians serving in this theatre fought successfully against the well-trained, heavily armed German forces. From Sicily to the Moro River, Ortona, the Liri Valley, the Gothic and Rimini Lines, Montone and Senio, the First Division proved itself in difficult terrain and costly battles that often favoured the well-entrenched German defenders. More than a quarter of the Canadian soldiers in Italy became casualties: 5,399 killed, 19,486 wounded and 1,004 taken prisoner. General Vokes led 1st Canadian Division through the brutal house-to-house fighting and north to the Hitler Line (courtesy Library and Archives Canada/PA-116852). On D-Day, 6 June 1944, the Allies invaded Normandy to begin the 11-month advance through France and northwest Europe into Germany. 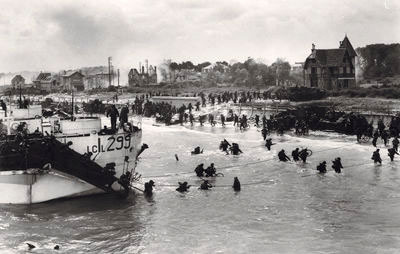 About 14,000 Canadian soldiers took part in the Allied landings across a 90-km front. After storming Juno Beach, Canadians advanced further inland on the first day of the invasion than either the British or American forces. 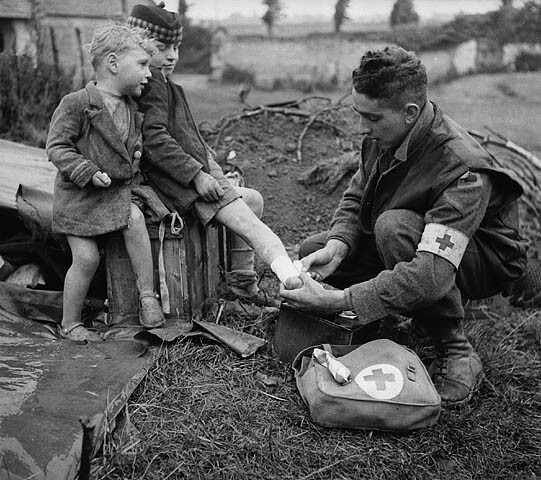 D-Day was a pivotal success, but the cost for Canada was high — 359 killed in action, 715 wounded and 47 taken prisoner. The Canadians’ success on D-Day, however, was followed the next month by a disaster in the advance toward Falaise, an offensive designed to cut off retreating elements of the German army. Canada’s Second and Third Divisions had been united into II Corps under Lieutenant General Guy Simonds only weeks before. 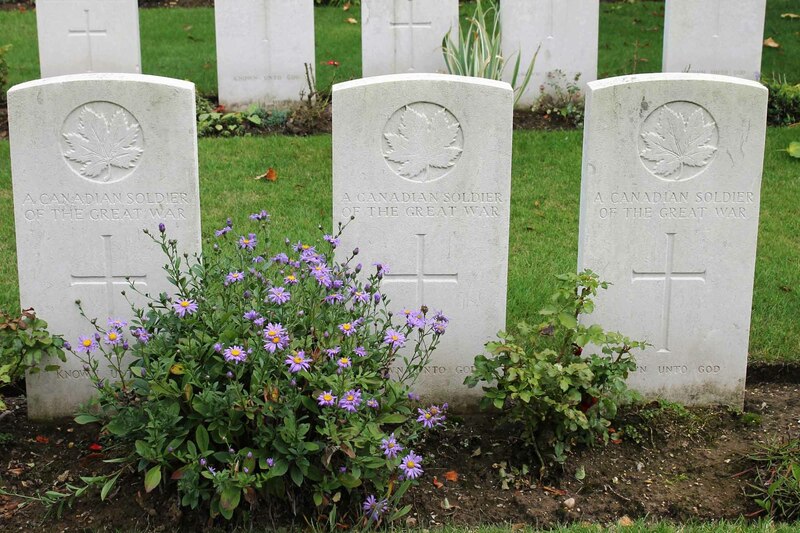 During Operation Spring, on 25 July, the Canadians suffered some of their worst casualties in the war — the day’s losses being second only to those endured at Dieppe. Through the summer, amid difficult conditions, the First Canadian Army under General Harry Crerar continued to batter its way southward in the face of tenacious German resistance. The Allies finally captured what remained of German forces in northern France on 21 August, bringing the Normandy campaign to an end. 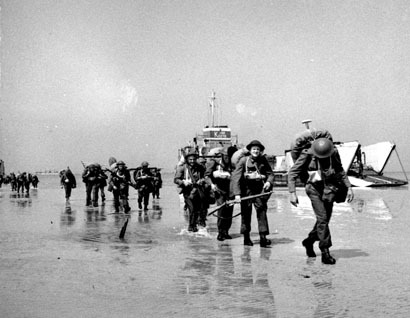 Canadian soldiers landing on Juno Beach, Courseulles-sur-Mer, France, June 6th, 1944. 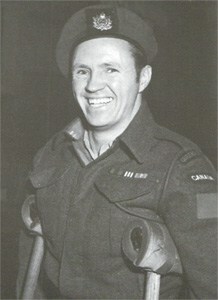 Image: Lieutenant Ken Bell / Canada. Dept. of National Defence / Library and Archives Canada / PA-132655. As the Allies advanced eastward toward Germany, the Canadians were tasked with liberating the vital English Channel ports, including the Belgian city of Antwerp and the surrounding Scheldt Estuary. (See Liberation of the Netherlands). General Crerar would soon command the largest Canadian field army ever — more than 450,000 men — reinforced by Canadian forces who had been fighting in Italy, as well as other international units. In March 1945, Canadian soldiers, fighting alongside British and American forces, crossed the Rhine and would soon help achieve the final defeat of Hitler’s Third Reich. Three-quarters of Canadian brigade commanders and 90 per cent of unit commanders had been militiamen before the war. Of the more than one million men and women in the armed services during the war, more than 730,000 served in the army — which suffered the loss of 22,910 killed, 52,679 wounded and 6,433 taken prisoner, a significant toll for a small nation of 11 million people. 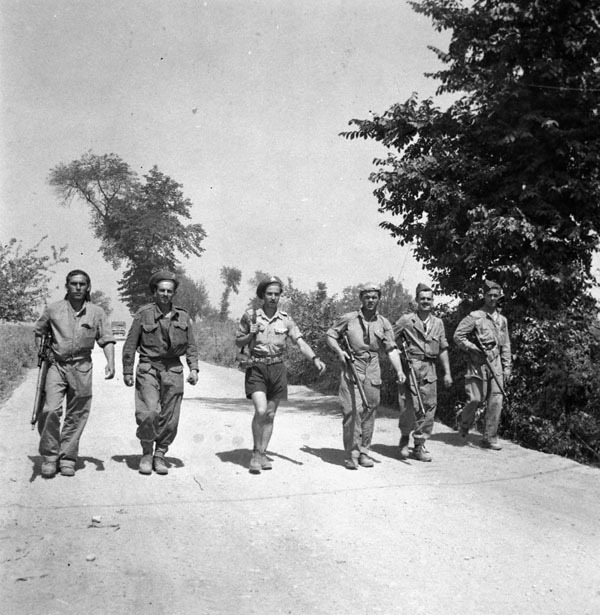 Like the Canadian Corps of 1918, the First Canadian Army of 1945 had become a professional, highly effective force with a solid military reputation. 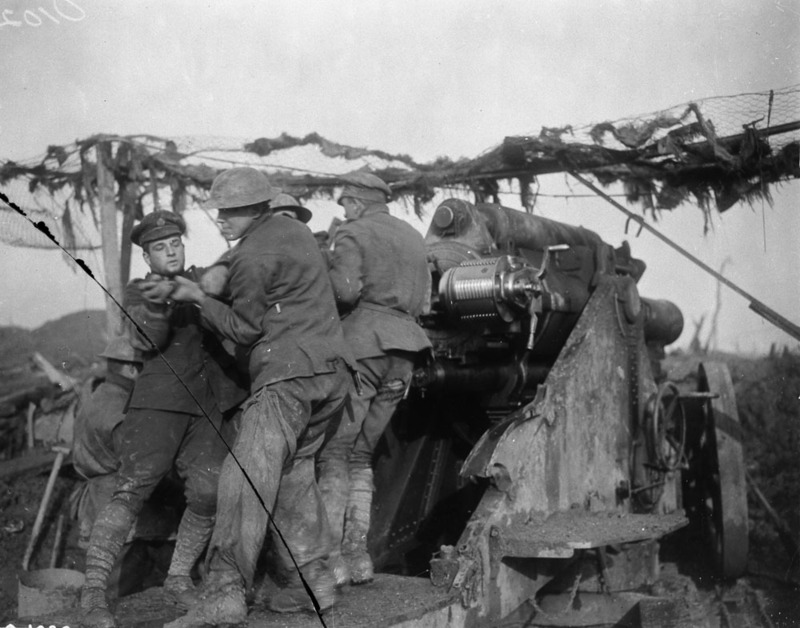 As it had in 1919, the Canadian Army dispersed rapidly after the Second World War. The remaining active and reserve forces were underfunded and ill-equipped in the early years of the Cold War that broke out between the American-led Western bloc and the Communist Eastern bloc, led by the Soviet Union. In 1949, Canada joined the North Atlantic Treaty Organization (NATO). By that time, Canada had already entered its first United Nations (UN) peacekeeping mission in the Kashmir region, observing the newly established demarcation line between India and Pakistan. The Canadian Army’s peacekeeping tradition soon became firmly established with its participation in the UN Truce Supervisory Organization for Israeli and Arab territories and its 1954 role in Indochina supervising and controlling territories previously held by France. On 25 June 1950, Communist North Korea invaded South Korea. In February 1951, Canada sent the 2nd Battalion, PPCLI, to enter the frontline under command of the 27th British Infantry Group. Second battalions from the RCR and Royal 22e Régiment became part of the Commonwealth Division alongside two British brigades. Both groups sustained frequent casualties in sharp skirmishes and larger operations, often against highly skilled and heavily armed Chinese forces. With their expert use of machine guns, Bren guns, rocket launchers and mortars, the Canadians were immersed in a war to prevent the loss of South Korea. 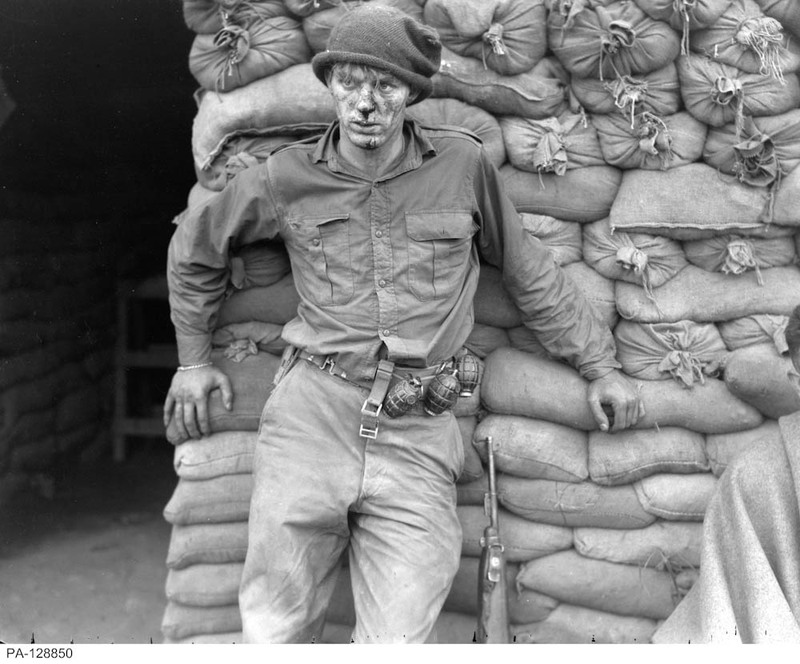 The ceasefire of 27 July 1953 ended the fighting, Canada having lost 312 in action and 94 in non-battle deaths, while 1,202 were wounded and 33 taken prisoner. The 38th parallel was re-established as the border between the two Koreas, and the Canadian Army could take pride in its contribution to the containment of Communism (See Korean War and Battle of Kapyong). 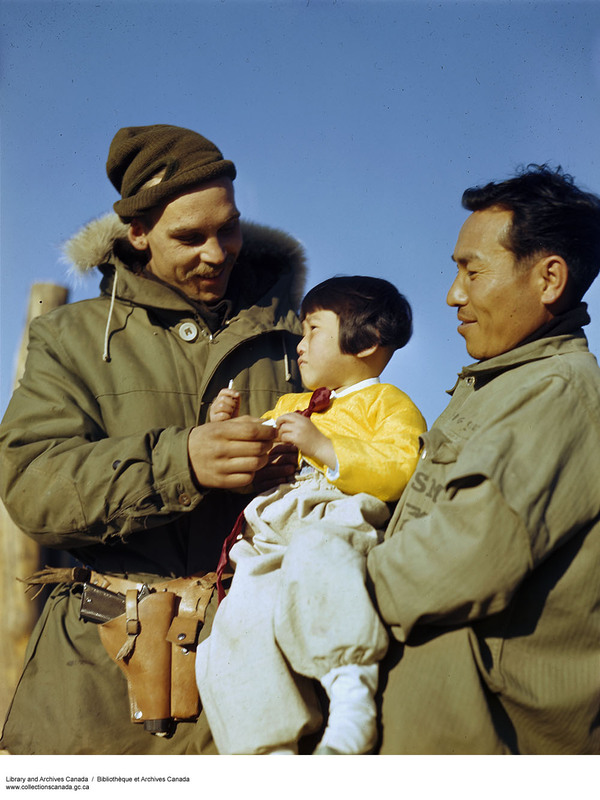 2nd Battalion Princess Patricia's Canadian Light Infantry soldier with a local family in Korea, ca. 1943-1965. Image: Copyright Canadian Department of National Defence/Library and Archives Canada/R112-2643-X-E. The three units that served in Korea were sent to join NATO forces in Europe and were later relieved by their 1st Battalions in 1955. World peace teetered in the balance once again during the Suez Crisis of 1956. Lester Pearson, Canada’s secretary of state for external affairs, helped to resolve the crisis by establishing the United Nations Emergency Force (UNEF) that included a contingent of more than one thousand Canadian soldiers — about one-sixth of the entire UN force. It preserved stability in the area for 10 years and was removed just before the outbreak of the Arab-Israeli war of 1967. Canadians formed the largest contingent of UNEF, and when Pearson won the 1957 Nobel Peace Prize for his role, Canada’s self-image as a peacekeeper nation was solidified. In March 1964, Greece and Turkey were on the verge of war in a dispute over the Mediterranean island of Cyprus. 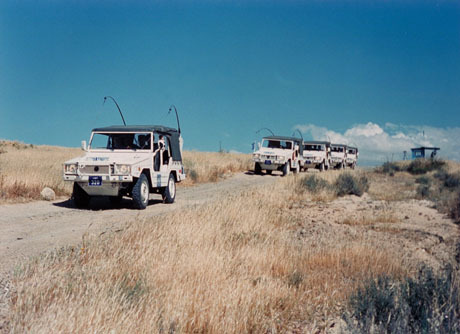 Canadians formed a major part of the UN peacekeeping response, with units of the RCR, PPCLI and the 48th Highlanders serving in Cyprus for 29 years. 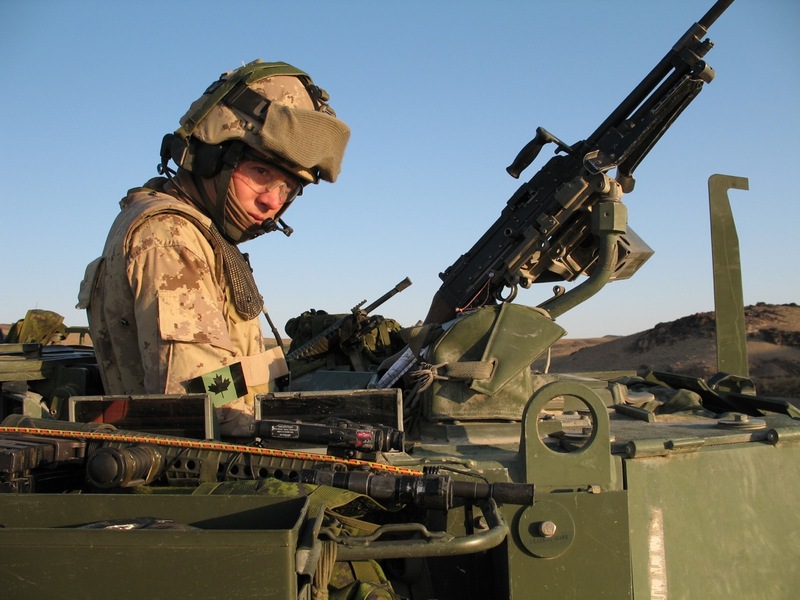 During the peacekeeping era, Canadians adopted American-pattern weapons, equipment, training methods and communications technology, replacing British patterns that had been the model for Canada’s army since the colonial era. In 1969, the Canadian contingent to NATO was moved to Lahr, West Germany, where it served in close proximity to American forces. Cost-saving measures implemented by Defence Minister Paul Hellyer, such as unification of the army, air force and navy into a single service, proved unsuccessful due to a subsequent decline in military morale and a failure to bring about the desired savings. 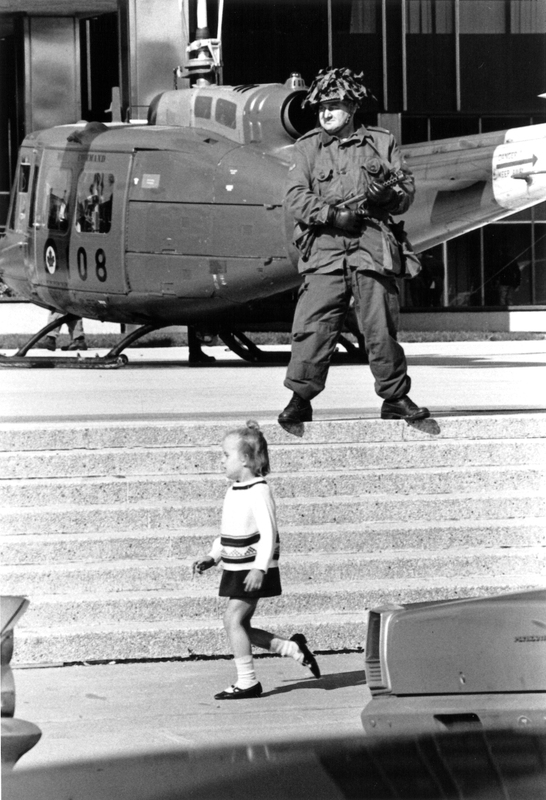 The Canadian Armed Forces now numbered less than 80,000, a severe drop from the 1963 level of 120,000. Canada’s NATO force was reduced by half, falling to 5,000 personnel. However, Canada maintained its commitment to UN efforts, participating in every Cold War–era peacekeeping operation until 1989. Canadian troops helped maintain stability in India/Pakistan, Israel/Egypt, Iran/Iraq and Central America. By the early 1990s, the Soviet Union had dissolved, the Berlin Wall had been dismantled, and East and West Germany were reunited. As regional and ethnic conflicts proliferated, no longer held in check by the restraints of the Cold War, and as areas in conflict began to resist UN intervention, what had once been “peacekeeping” missions degenerated into more contentious “peacemaking” efforts. Canadian forces played a limited role in the UN-sanctioned coalition against Iraq during the Gulf War of 1991, after its invasion of Kuwait. The following year, during the vicious civil war in the former Yugoslavia, a contingent from the RCR and Royal 22e served with the UN in Sarajevo under the leadership of Major General Lewis MacKenzie — primarily securing the airport of the besieged city. There were too few UN soldiers in the area, and danger mounted as Serbs fired heavy guns from the surrounding heights into the city. 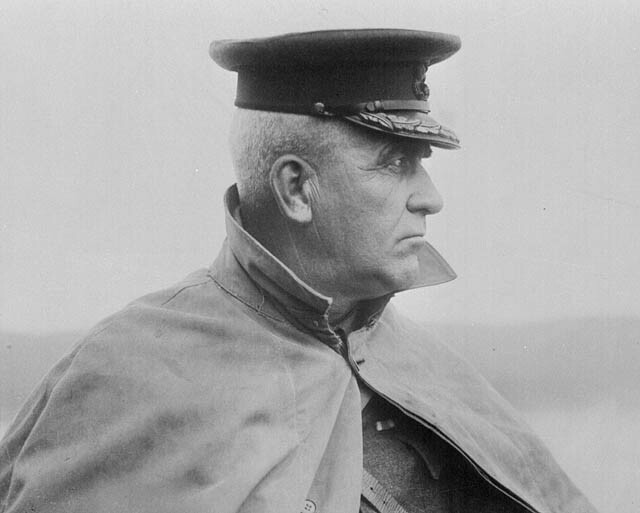 MacKenzie remained a staunch supporter of UN peacekeeping but warned of worsening supply shortages for the mission and also of the difficulty of commanding a mission on the ground when many crucial decisions needed to be routed through UN headquarters in New York. Similarly for the 1993 UN missions to Somalia and Rwanda, the impossibilities of maintaining effective control, discipline and morale with insufficient resources became even more apparent. In Somalia, the Canadian Airborne Regiment (CAR) became the subject of intense scrutiny when a Somali teenager was tortured and killed in the Canadian camp. The incident led to a long political inquiry in Canada and, ultimately, to the disbandment of what had been Canada's elite army regiment. That same year, Canadians were involved in other UN missions around the globe, comprising 10 per cent of the total troops in UN service. Problems grew on all sides. In 1994, Serbs took 400 peacekeepers hostage, including 55 Canadians. From his posting in command of the UN mission in Rwanda in 1994, Canadian Major General Roméo Dallaire appealed for more troops to stop the Rwanda genocide but was powerless to halt the unfolding catastrophe. Senator Roméo Dallaire. 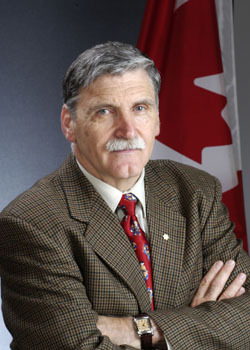 Following his experiences as a UN peacekeeper in Rwanda, Dallaire became an advocate for the world's victims of genocide (courtesy Senate of Canada). In a half-century of peacekeeping missions, Canada lost 122 soldiers — the price paid for a middle power’s efforts to help preserve world peace. In September 2003, Canadians were reminded of the peacetime services of the Canadian Army when 2,200 personnel fought massive forest fires in British Columbia. Over the decades, the military had often assisted with keeping order during periods of civil unrest and catastrophe, such as during the labour strikes of the 1920s and 1930s, and the 1970 FLQ (Front de libération du Québec) Crisis, when a thousand troops of the Royal 22e and other regiments were called out to patrol Montréal under the War Measures Act. 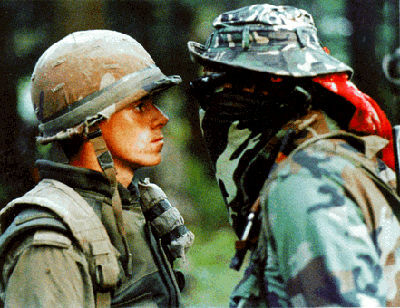 The army also provided assistance during the 1990 Oka Crisis. In addition to sandbagging, relief and rescue efforts during flooding in the Fraser Valley, Red River and Saguenay regions, Canadian troops continued in a national rescue role during the ice storm of 1998 in Ontario and Québec. Amid these efforts, Canada’s Regular Force army hit a low point of 19,700 in 2001. Attitudes toward the military, however, rebounded drastically after the 11 September 2001 terrorist attacks on New York and Washington, DC. The 9/11 attacks, as they came to be called, resulted in a US-led international campaign in Afghanistan to oust the Taliban regime that had sheltered the al Qaeda terrorists. In Canada’s first war-fighting deployment since Korea, 900 soldiers from 3rd Battalion PPCLI were sent to Kandahar Airfield. In 2005, Canada also sent a reinforced battalion group of 2,000 troops to Kandahar. Soldiers faced small arms fire, rocket attacks, suicide bombers and deadly improvised explosive devices (IEDs). By 2010, Canada had 2,500 troops in Afghanistan fighting a full-scale counterterrorism mission, the nation’s largest commitment since the Korean War. Canada’s combat role in Afghanistan officially came to an end in 2011. The death toll was 158 soldiers, two-thirds of whom were infantry, most of them killed in IED strikes. Among the casualties was Captain Nichola Goddard, an artillery officer who, in 2006, became the first Canadian female soldier to die in action. The citizen soldiers of the 19th century militia, the volunteers and conscripts of the two world wars, and the celebrated peacekeepers of the late 20th century have been superseded by the soldiers of a modern professional army, one that returned from Afghanistan as a highly trained, technologically advanced force. As of 2015, the army was made up of more than 21,000 Regular Force soldiers, 20,000 Reservists and 5,000 Canadian Rangers who patrol northern and remote coastal regions. The regular army today consists of three mechanized brigade groups centring on the Princess Patricia’s Canadian Light Infantry in the West, the Royal Canadian Regiment in Ontario and the Atlantic provinces, and the Royal 22e Régiment in Québec, with each mechanized group also including armoured, artillery, reconnaissance, engineer and other supporting arms. The Reserve component consists of 10 territorial brigade groups located in 100 communities across Canada, including a range of infantry, armoured reconnaissance, artillery, engineer and supporting arms that assist with domestic tasks and provide trained reinforcements to the Regular Force during foreign deployments. The army is respected for its expertise and tends to be held in high regard by the Canadian public. The attack on army reservist Corporal Nathan Cirillo as he stood guard over Ottawa’s National War Memorial on 22 October 2014 brought forth a nationwide outpouring of grief for the Canadian military. Such solidarity represents the enduring esteem of Canadians for the men and women of the army. J. L. Granatstein, Canada’s Army: Waging War and Keeping the Peace (2002, rev 2011). Stephen J. Harris, Canadian Brass: The Making of a Professional Army, 1860–1939 (1988). Desmond Morton, A Military History of Canada (1985, rev 2007). Jonathan F. Vance, Maple Leaf Empire: Canada, Britain, and Two World Wars (2012). James Wood. Militia Myths: Ideas of the Canadian Citizen Soldier, 1896–1921 (2010). Canadian Army The Canadian Army's official website. 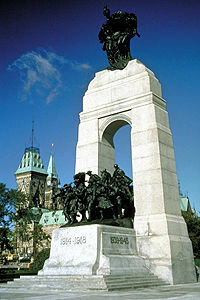 Veterans AffairsVeterans Affairs Canada's history page on the Canadian Armed Forces. Princess Patricia's Canadian Light InfantryThe official website of one of Canada's three permanent-force army regiments. Royal Canadian Regiment The official website of one of Canada's three permanent-force army regiments. Royal 22e Régiment The official website of one of Canada's three permanent-force army regiments. Canadian War Museum Browse the many online exhibits of the Canadian War Museum.